Fuel cells have been tagged as promising energy sources for everything from buildings and cars to cell phones and yet-to-emerge micro-devices. With an eye toward the small end of the scale, a researcher at Lawrence Livermore National Laboratory has made a fuel cell that could eventually power consumer electronics. The thin-film fuel cell consumes methanol, and is smaller and would be cheaper to make than rechargeable batteries, according to Jeff Morse, a researcher in the lab’s center for micro-technology engineering. Morse made prototype fuel cells using materials and processes borrowed from computer chip manufacturing, the emerging field of microelectromechanical systems (MEMS), and microfluidics. A fuel cell works by converting chemical energy into electrical energy and heat. Like a battery, it uses a cycle of chemical reactions between positive and negative electrodes to produce an electric current. Unlike batteries, fuel cells are supplied by fuel -- commonly some form of hydrogen -- and need to be refueled rather than recharged. In a typical hydrogen fuel cell, the hydrogen fuel is flowed into the cathode, or negative electrode, and air flowed into the anode, or positive electrode. The porous metal electrodes act as catalysts to speed the reactions of hydrogen gas from the fuel and oxygen from the air with the electrolyte, a pool of chemicals bathing the electrodes. At the anode, the oxygen reacts with water in the electrolyte to form hydroxide ions. At the cathode, the hydrogen fuel reacts with the hydroxide ions to form water, releasing two electrons per hydrogen molecule. The released electrons flow through an external circuit. This electrical current can be tapped to produce work. The chemical cycle also produces heat. The Livermore fuel cell is designed to use replaceable fuel cartridges filled with methyl alcohol, or methanol. Each cartridge fuels the power pack for twice as long as a lithium ion battery lasts on a single charge, and could eventually last close to three times as long, according to Morse. Fully loaded, the fuel cell weighs 8 grams and produces 1 to 2 Watts of power, or about 3,000 work hours per kilogram, according to Morse. The cells could be made as small as 5 by 3 by 3 centimeters, he said. 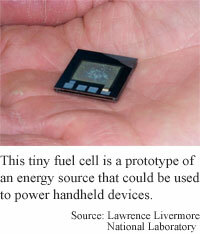 The small fuel cell is made from a thin polymer film, with thin-film electrodes of platinum and ruthenium. Key to shrinking the fuel cell was combining microelectronics with microfluidic plumbing. A micro-machined flow field of channels etched into silicon circulates methanol over the anode and air over the cathode. The channels range from a millimeter to one-tenth of a millimeter wide. The fuel cell also contains electrical elements that heat the components, which speeds the ions bound from the anode to the cathode, enabling the cell to produce more power. The researchers' design must become more efficient before it can challenge existing fuel cell designs, according to Morse. “Our fuel conversion efficiency is slightly less than conventional fuel cells. Our estimates for present designs are thirty-five percent,” he said. Conventional large fuel cells extract about 60 percent of the energy available in the fuel. Batteries, meanwhile, can convert about 75 percent of the chemical energy they contain into electrical current. Fuel cells are more often considered as an alternative to internal combustion engines, which burn fuel rather than chemically extracting electricity from it. The combustion engines in today's cars produce much more waste heat and are only about 15 to 20 percent efficient. To date, diminutive fuel cells have not measured up well against conventional batteries, said Lutgard C. De Jonghe, professor of ceramics in the department of materials science and engineering at the University of California at Berkeley and senior scientist in the materials sciences division of Lawrence Berkeley National Laboratory. “In general, comparisons of small fuel cells with same size batteries is quite unfavorable for the fuel cell, both in power and energy density." One inherent problem with thin-film fuel cells is seepage of fuel before it can react with the anode. "Important issues such as methanol crossover have been a problem for polymer membrane fuel cells,” said De Jonghe. This methanol crossover can sap around 20 percent of a fuel cell’s fuel and slightly lower its voltage, dropping its overall efficiency. The MEMS fuel cell could find uses in portable electronics, small sensors, and military electronics, according to Morse. It could be ready for practical use within three years, he said. Morris presented the work at the Lawrence Livermore National Laboratory NanoSIG conference in Livermore, California on Februrary 14, 2002. The work was funded by the lab. © Copyright Technology Research News, LLC 2000-2011. All rights reserved.